By default, Windows 10 shows a search box on your Taskbar, which takes up a lot of room for no really good reason, since you can search by opening the start menu and typing whatever you searching for without using a search box. Or you can, if you like, replace the big taskbar search box with a search icon and give yourself more taskbar space for your favorite shortcuts. As far as we’re concerned, the taskbar should be reserved for things like shortcuts to your favorite programs, not things like big search boxes. Taskbar search is very useful, indeed, but you don’t need the big search box hogging up valuable taskbar real estate, do you? OK. Look below. Does your Windows 10 taskbar look like this? Then all you have to do is right-click in the search box and choose Search –>Show search icon. You’ll have more room on your taskbar and if you want to search for something just click the search icon. Remember, if you choose to hide the search completely, that’s fine. Instead of choosing “Show search icon” you can choose “Hidden”. You’ll still be able to do searches with ease. Just do your searches by opening the start menu, then just start typing whatever you’re searching for. 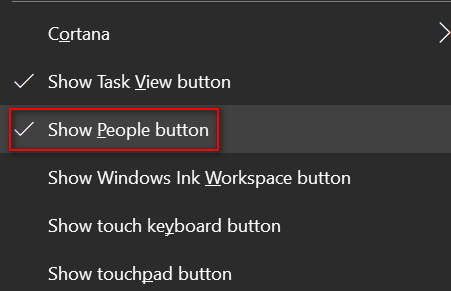 And if you’re using Windows 10 Fall Creators Update (version 1709) or newer, you can save space by removing the “People” button if you don’t use it. And you don’t use it, do you? This was such a great tip–now my taskbar has lots of room…thanks once again!